A program followed by Awards Ceremony! Presentation information can be found here. $200, sponsored by Veridian Credit Union, will be awarded to the winner in each category. Individuals and groups should enter their project in one of the award categories and select two alternate categories in rank order. Projects can be local to the Cedar Valley to global, highlighting service in another country. Projects (curricular and co/extracurricular) can date back to Summer 2018. We ask that you park in the lot for which you have a parking pass. 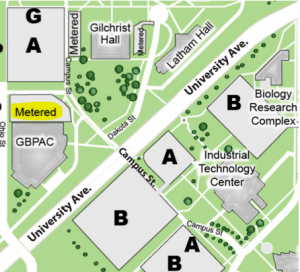 Please do not park in the metered lot; this is reserved for off-campus attendees. If you have materials to drop off, volunteers will be available to assist you at the main entrance of the GBPAC. We ask that you park in the metered visitor lot North of the Gallagher Bluedorn Performing Arts Center. The lot highlighted in yellow on the map below. For more information please contact Kristina Kofoot via email at kristina.kofoot@uni.edu or by phone at 319-273-4507.